Sashiko is a Japanese embroidery technique that is simple to learn and beautiful to look at. Even though it’s a craft that’s been around for a very long time, the traditional designs are very clean and graphic, and I love how modern they seem. Sashiko combines the quick, hands-on creativity of embroidery with a calming, meditative quality as well. I learned about Sashiko and how to do it last year by reading Mari’s helpful Sashiko Tutorial on The Purl Bee and I’ve been wanting to do more ever since! 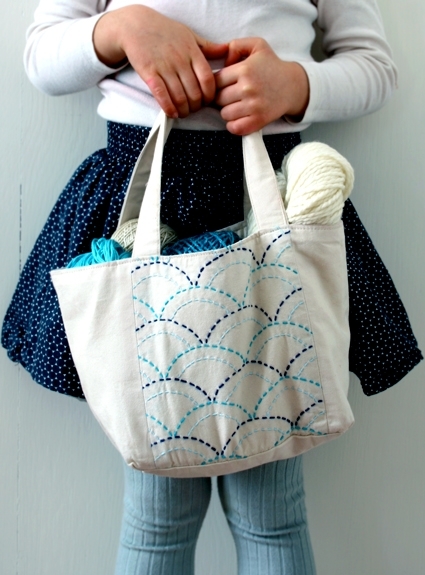 This Sashiko Mini Tote Kit is a great place to practice your Sashiko skills or to learn them for the very first time. It comes with almost everything you’ll need; the fabric (which has the Sashiko design printed right on it), navy Sashiko thread, and an ultra easy to follow pattern. I also used two additional colors of Sashiko Thread for the bag above, aqua and sky blue, so that the design would be more playful. I love how the different blues look so clean and cheerful on the natural canvas background! This exact same kit can also be made into a cute, simple apron. I chose to make mine into the tote because I thought it would be perfect as a small project bag. After it was done I also realized it would be a great lunch bag or child’s purse. 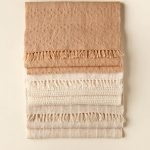 Note: Unfortunately we no longer carry the kit but that we have lots of Sashiko Samplers available here. That’s lovely sashiko making the tote so cut! Been wanting to try some sashiko. Great inspiration! que bonito el sashiko! tengo varios libros en casa sobre esta tcnica japonesa pero nunca me ha dado por poner me con ello. What a lovely interpretation of a Japanese graphic. I especially like the multiple tones of blue you’ve chosen. 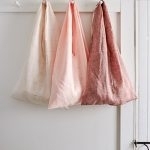 Have never tried sashiko but this project makes it very tempting! This is so beautiful ! Love the blues. i think i just found this year’s easter ‘basket’…. 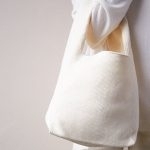 I love the clean lines of sashiko, and I love this bag – I shall definitely be trying this out. Thank you! How cute, looks like so much fun! Oh this bag it’s really nice, these colours make me think about clouds, they are really nice!!!! I love the bag and embroidery, but I also really love the skirt! Was that homemade? Do you have a pattern for it? perfectly charming, and just the little blast of inspiration that this girl needs…thanks! What a cute bag!!! What is the skirt she is wearing? Is that pattern I could find somewhere? It is darling! I love your site! It gets my creative juices flowing! I have visited your stores in SOHO & I was greeted w/ welcoming & "helpfu"l arms in the heart of the big city! I am looking forward to visiting you at your new "digs" ! Much continued, good fortune & keep up the good work! Hi! I recently purchased the kit and just cut the fabric into pieces… then I realized that the pattern didn't fit as nicely as the picture above:( because of the length of the fabric. The cutting lines had to be between the two wave lines. What should I do? I also have two different blue threads. How can I make it look clean and pretty without making it look sloppy? Would you give me advice? Thank you Molly. I sent an email yesterday. 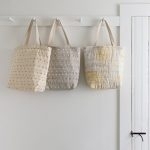 I'm a big knitter with a little experience with embroyidery and sewing and so happy to find this fantastic blog! So looking forward to hearing from you. Thank you again! I was wondering if this should be hand washed after the embroidery is completed? I noticed that the blue printed pattern seems to wash away. You can machine wash and dry this- and the guide marks will wash away.